Holy Stone HS100 Review (In-Depth) - The best mid range drone ? HS100 is a new drone from Holy Stone, released just a few days ago at the time of this writing. With HS100 Holy Stone seems to be trying to break into the mid-range market segment, both in quality and price. 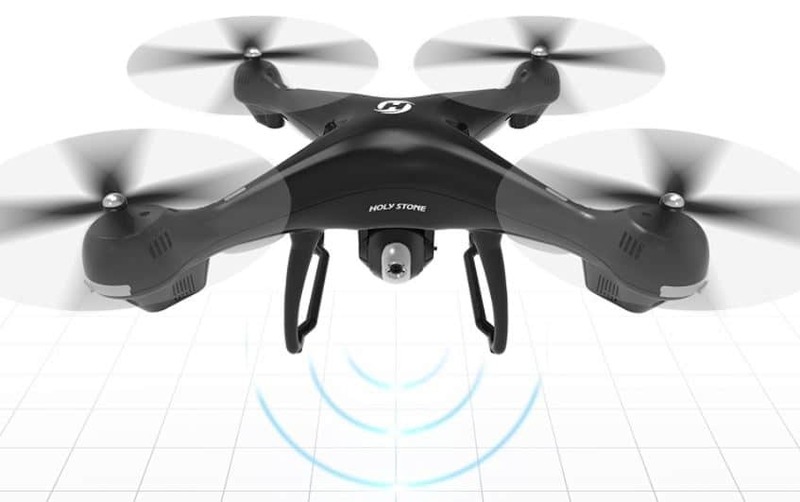 Up until now Holy Stone, an established Chinese drone manufacturer, has released low cost budget drones. That isn’t really the case with HS100. 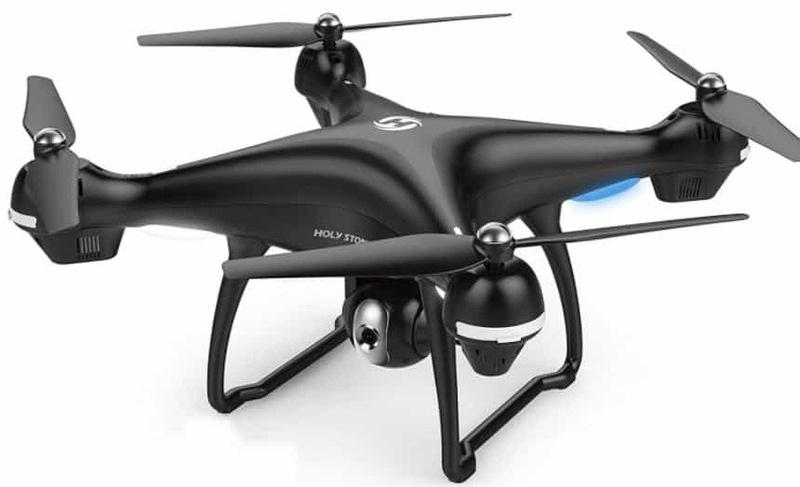 Things like built-in GPS and stabilized HD camera make this drone very interesting, but does all that justify the hefty MSRP price of about $275? Let’s take a closer look and see if we can answer that question. Enjoy reading our Holy Stone HS100 Review ! What makes Holy Stone HS100 interesting? Holy Stone HS100 is a rather large drone. Coming in at 50cm in length/width and almost 20cm in height (if we count the landing gear), this is one of the more massive drones that I’ve had the opportunity of testing. 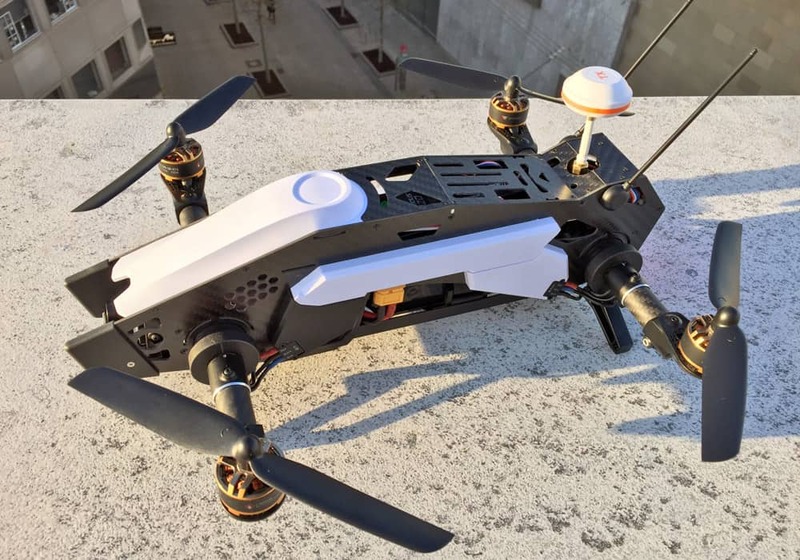 Together with battery, drone measures about 700g in weight. Drone body stretches out to the sides where blades are, similar to Hubsan X4 series. Camera hangs underneath the drone, and the battery plugs from behind. LEDs under the blade arms are clearly visible and will notify you about paring status between the drone and the transmitter, GPS lock status and battery status. Blade guards are optional and can be removed if you are a more confident pilot. Build quality is one of the better ones I’ve seen from recently released drones. One quick tip, don’t force the screws in too much when changing blades/guards/landing gear because you might damage the thread. It happened to me so I had to get creative to unscrew one of the blade guards. Let’s get right down to business and talk about how HS100 behaves when push comes to show. To get the drone up in the air just push the one-key takeoff button. Same button is also used to land the drone afterwards. Transmitter is very responsive and speed is adjustable, to help new pilots, but also to challenge more advanced ones. FPV stream within the range is stable, although range could be better. It cuts off after about 150m, which is a bit disappointing. Transmitter itself has a range set at a much higher 500m, which makes such a short FPV range even more infuriating. Should you go out of range of the transmitter drone automatically activate GPS aided return to home function. A nice touch from Holy Stone to prevent losing the drone. I have to say that I have mixed feelings about the camera on this drone. Holy Stone paired some very useful features with a mediocre camera at best. I mean don’t get me wrong. 720p wide angle camera with decent stabilization isn’t something to cry home about. I haven’t noticed any jello effect or camera wobble, which usually ruins video recordings on these low to mid-range segment drones. Camera features an electronically adjustable 90° tilt, which is adjusted using a scroll wheel on the transmitter. This is the useful feature that I was talking about. With that being said, once I got the drone up in the air and made a few video recordings I felt slightly disappointed with the quality of the video that I was getting. Quality isn’t the worst I’ve seen on the drone, but it also isn’t something that I personally think justifies a $275 price tag. Videos lack sharpness, which you can see in the posted flight test footage. Videos and photos are saved to an micro SD card (8GB card comes free of charge), using dedicated buttons on the transmitter. As far as the battery goes, I really don’t have any complaints other than the extremely lengthy charge time. Capacity of around 2500mAh provides between 10-12 minutes of flight time. Battery operates at 7.4V, so it can deliver plenty of power to the powerful brushless motors. Sadly it uses standard USB for charging, and depending on your adapter plug, it could take between 3-6 hours to charge the battery. Luckily if you order HS100 from Amazon you also get a coupon for a free spare battery, for double the flight time. Battery has a handy status LEDs, which tell you how much juice is left, just like power banks have. Transmitter is quite large, just like the drone, and has a very good build quality. Nothing creaks or bends when you hold it in your hands, plus it is rather heavy, which is a universal sign of good quality, right? The three buttons underneath the joysticks are for activating return to home function, powering on the transmitter, and activating altitude hold, from left to right. Left trigger section has a scroll wheel for adjusting speed and buttons for activating “follow me” and GPS tracking. Right trigger has a scroll wheel for adjusting camera tilt, and two buttons for taking photos and starting video recording. Joysticks use the usual 4 channel setup with yaw/altitude on the left one and pitch/roll on the right one. Holy Stone HS100 comes with a bunch of additional features that I’ll cover in one quick swoop. Follow me mode – activating this mode forces the drone to follow the transmitter on its own. Useful for when you want to record yourself running or riding a bike. Activate follow me mode, start running and the drone will faithfully follow you around like a dog, recording your ever move. Return home – return home mode uses GPS to return the drone to a starting position at a press of a button. It works great and is rather accurate with obstacle avoidance built-in. 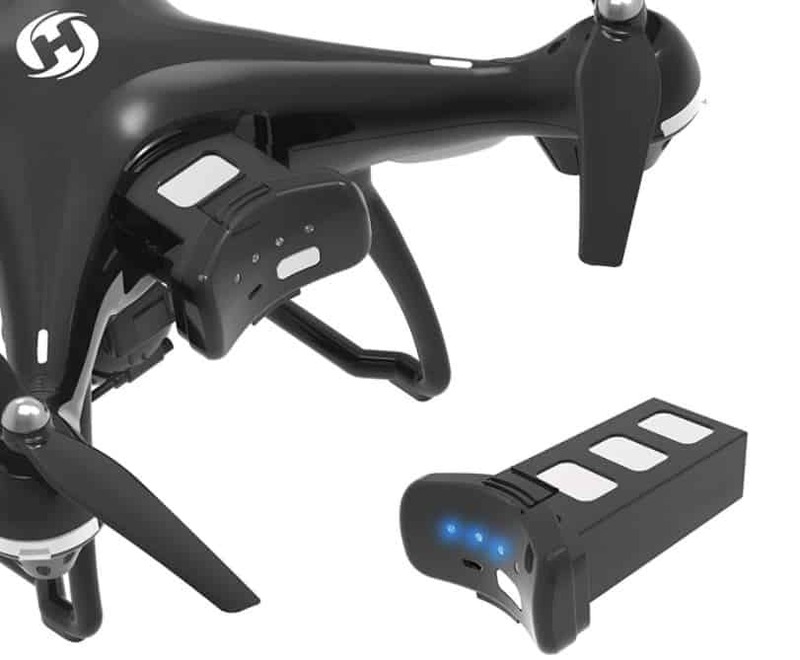 Micro SD card slot – there is a micro SD card slot on the drone for saving videos and photos to a micro SD card, instead of your phone, to avoid lag and stuttering. 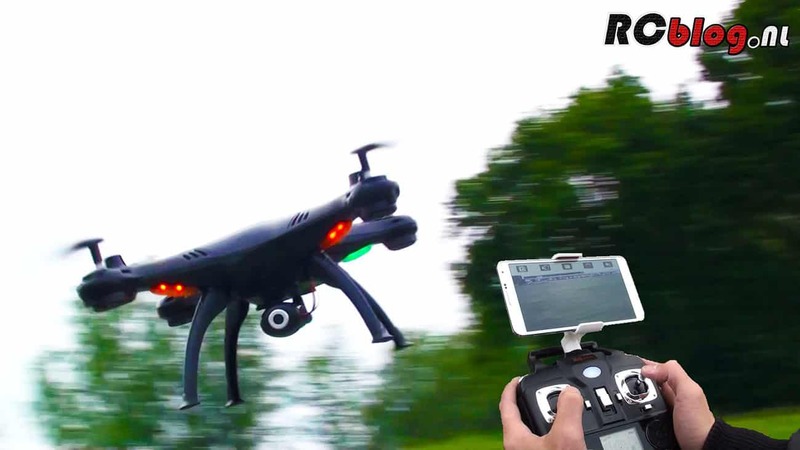 Headless mode & altitude hold – HS100 has headless mode if you don’t know how to fly a drone using yaw, pitch and roll. It’s great for beginners who are not very experienced in piloting drones. Altitude hold is also available, which automatically hovers the drone without the need to hold throttle. 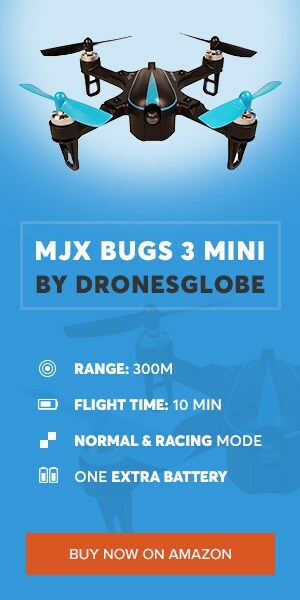 Adjustable speed – fine tune the speed of the drone to your liking using a scroll wheel, like that on a mouse. Beginners should probably start with the lowest speed setting because the drone is quite fast. Emergency stop – last but not least, HS100 has security measures in place for when you go out of range with the drone. It will automatically return the drone home, using GPS, to prevent it from flying off. Furious 320 by Walkera is probably faster than your car ! 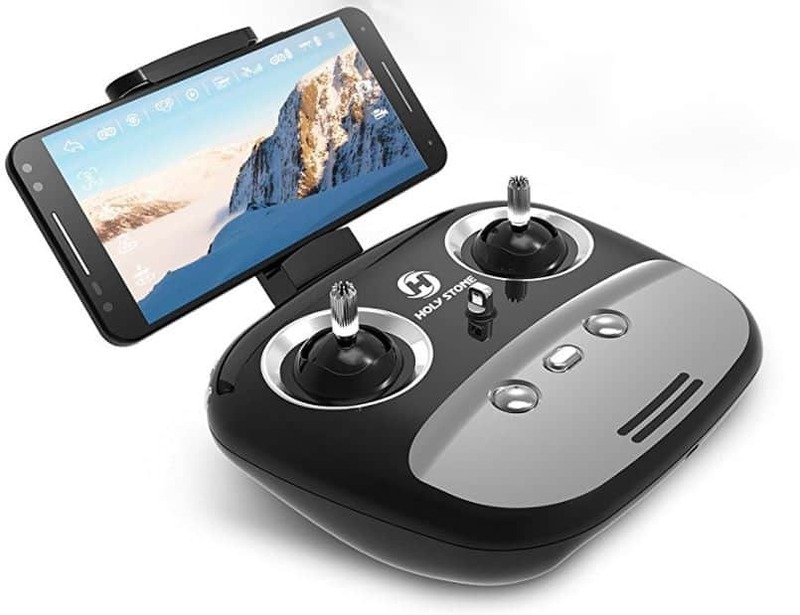 I liked your review of the 'Holy Stone GPS FPV RC Drone HS100'. I agree about word for word with you, if I had to review it. I recently bought one for my son for Christmas, however, I returned it due to a glitch. After 2 runs, it got 'stuck' veering left and parked itself in the top of the worst, highest, dead tree possible. Took me 2 days to get down. Almost pulled it off, but got damaged in the last little fall. Just missed it. We're newbies and I didn't wanna start cheap. I wanted a decent quality mid-level drone with a camera in the $200-$300 range. For the features it offered, thought it was a decent choice for $289 (Amazon). Seemed liked a no-brainer at the time for what I was seeing available on the market. But, I'm also not well versed on where to look and what to look for. I held off on getting another till I did more research. Then I found your site by accident. My biggest concerns at the moment repurchasing it are: I was told this is their new model and additional batteries and chargers weren't available. I see a price credit on Amazon, but not the free battery. It has no real history yet, that I'm aware of, so longevity is also a concern. Another is customer support. China, China China. They are very friendly, but the languge/lingo barrier makes it near impossible to get the correct assistance. Theirs responses to my questions were completely off the reservation. It is what it is, but I just wanna git'er done. Not to mention the ridiculous hassle of sending in for 'assessment' and the length of wait time with emails, shipping and so forth. I'm confident it would not have been a speedy process. Been there before. All that said, I can't find any good comparisons. So I wanted to get your opinions. For the price and features, is this my best choice? To repurchase? Or can you tell me about any better ones with the same, or more, features within that price range? For beginners, I didn't really wanna go over $300, if possible, until I know this is something we could really get into. I just can't justify $400 and up. Yet. Especially the ones over a $1000, for 25 min of flight time. Regardless of features. That's crazy. I'm just a poor 'ol blue-collar workin' schmuck. Can't do the 'rich guy' whimsical purchases. At least, not yet. Sorry if I bored you, but I'm the though-type and I thought my experience might be useful to you. I try to be an informed and careful consumer, but I need help with this one. There's so many out there. I'm just getting lost in the mud. I would greatly appreciate anything you can offer me for the best drone possible in my price range, with said features. This article's Additional Feature section lists "Emergency Stop" but its description is incorrect. What is described is return to home and not emergency stop. Emergency stop is long-pressing the takeoff/land button which stops all drone motors--the drone will drop like a rock. I need some help from knowledgeable people selecting a drone, so I sent you a message. It said, "your comment is awaiting moderation."